child, cleft palate, weight at birth. Introduction: The presence of low weight at birth (LW), as well as cleft lip and palate (CLP), end up making children more prone to auditory alterations. Objective: Verify and compare the hearing of children with cleft lip and palate with and without low weight at birth in the conventional audiological evaluation. Method: A retrospective and comparative study was made concerning gender, weight at birth, presence/absence of CLP and the result of audiometry and immittance measurements. Three groups of children were formed. G1 with 23 CLP and LW, G2 with 25 CLP but not LW and G3 with 25 children with neither CLP or LW. Results: There wasn't found any statistically significant differences between the groups in none of the following comparisons: the weight and gender, gender and right/left ear, in relation to the kind of tympanometric curve, presence of hearing loss, type of hearing loss and degree of the hearing loss. Conclusion: A greater auditory impairment, evidenced by the presence of light to moderate degree of conductive hearing loss, was found in children with cleft lip and palate (G1 and G2), regardless of the presence of low weight at birth, when compared to those without this kind of malformation. Studies indicate the technological and scientific advances as responsible for the increase of survival of premature children, neonates with low weight and newborns with other severe impairments. On the other hand, there are cases in which factors such as low weight at birth may cause increase of neonatal morbidity and delay in global development (1). Low weight at birth is among the main high risk neonatal factors. Scholars (2) classify low weight at birth between 1500 and 2500g; normal weight from 2500 to 4000g and, macrosomic weight above 4000g. There are pre, peri and post-natal incurrences that can cause hearing deficiency and these incurrences characterize the risk indicators (3). Several authors relate these incurrences to the appearance of sensory alterations, since the greater exposure to iatrogenic factors and to the possibility of association of multiple risk indicators end up becoming newborns, with risk indicators, more prone to present deviations ofhearing development (4-6). In a retrospective study (7), performed in a population of neonates, the low weight/small for gestational age (SGA) was pointed out as one of the main risk indicators for hearing loss at the newborn pre-term group, followed by use of ototoxic and mechanical ventilation. Regarding newborns at term, the authors pointed out congenital infection, family background, use of ototoxic and low age/small for gestational age (SGA) as the most frequent risk indicators for auditory alterations. In another study (8), when analyzing the different perinatal conditions associated to the presence of clinical communication disorders, the low weight at birth was identified by the mothers of the studied children as the variable of greatest occurrence. Also, craniofacial anomalies, such as cleft lip and palate, appears on the list of risk indicators for hearing (9), and frequently are accompanied by associated clinical manifestations and distant from the oral cavity (10). The auditory deficiency is a problem often observed in children with this kind of malformation (11). The cleft lift and palate are malformations that, among the craniofacial anomalies, are the most prevalent, standing out by the number of alterations and the complexity of its aesthetical and functional effects. Literature relates that the hearing of this population seems to be associated to effects in all levels of the auditory system, to the middle ear, through conductive hearing loss; to the cochlea, by the high frequency sensorioneural hearing loss; to the brainstem and central auditory pathways, by the auditory processing disorder (12). Considering that both the population born with low weight at birth, and the one with a craniofacial malformation appear among the risk indications for auditory deficiency, it was judged necessary to perform a retrospective comparative study of the audiometric and tympanometric findings of children born with weigh lower than 2500g and with cleft lip and palate, aiming to verify if the conjoint presence of these two indicators determines the appearing of a greater auditory damage. Besides, scientific literature focused on this association has proved to be weak. Therefore, having knowledge of the causes that determine the hearing difficulty presented by this population, from our clinical experience, it will be possible to provide orientation, as well as elaborate interventions which reduce and prevent the occurrence of those. The objectives of this study were to verify and compare the hearing of children with cleft lip and palate with and without low weight at birth on the conventional audiological assessment. After the approval of the Ethics and Research in Human Beings Committee (Process No 096/2009), was performed a retrospective study of audiological data of 73 children from 7 to 12 years of age, according to their medical record, chosen randomly, whose audiological evaluation was performed from July 2004 to June 2007, by the same phonoaudiologist, in a public hospital specialized on the treatment of craniofacial anomalies. All children included in this study did not present any associated genetic syndrome. This research was performed in 2009. From the medical records were obtained data about gender, weight at birth, presence/absence of cleft lip and palate and the conventional audiological assessment (audiometry and immittanciometry). -Group 1 (G1): 23 children with cleft lip and palate and low weight at birth (range of 1750 to 2490g, average weight of 2218g). -Group 2 (G2): 25 children with cleft lip and palate, without low weight at birth (range of 2600 to 3850g, average weight of 3160g). -Group 3 (G3): 25 children without cleft lip and palate and without low weight at birth (range of 2500 to 4100g, average weight of 3328g). 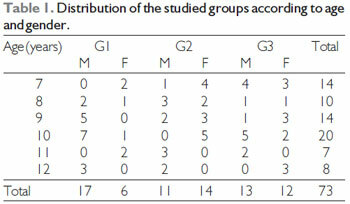 Table 1 shows the distribution between groups, according to age and gender. It is highlighted that no every baby with low weight at birth is a pre-term baby, and that not every pre-term baby presents low weight. Thus in this study the expression "low weight at birth" will be used regardless of gestational age. The classification of weight at birth followed FERNÁNDEZ-SANABRIA (2). Following the objective proposed, in the audiometry were verified the presence and absence of hearing loss. In cases that showed presence, were classified the type and degree of hearing loss. The type of hearing loss was classified in conductive hearing loss; sensorioneural hearing loss; mixed hearing loss (13). It was considered normal hearing when the audiometric thresholds stood between zero and 20 dB. The presence of hearing loss was established when in any of the tested frequencies, from 250 Hz to 8 KHz, the threshold was equal or superior to 21 dB. Thus, the hearing losses were classified, as far as degree: slight (from 21 to 40 dB); moderate (from 41 to 70 dB); severe (from 71 to 90 dB) and deep (above 91 dB) (14). The audiometries were performed with the use of the Madsen audiometer, model Midimate 622, supra-aural phones TDH 39, in the determination of tonal thresholds, as well as in the percentage index of speech recognition of each ear. Regarding immittanciometry, were verified the types of tympanometric curves, as well as presence and absence of auditory reflexes. On the tympanometries performed was used the Immittanciometer Grason Stadler Middle Ear Analyzer version 2. The frequency of the tone of the impendance probe was 226 Hz (conventional). The tympanometric measurements were performed automatically by the equipment, at a speed of 50 decapascal per second (daPa/s). The type of tympanometric curve obtained followed the proposed classification (15). The tympanometric curves were classified as normal and abnormal. Normal when was obtained the type A curve, and abnormal for the other types found (B, C, As and Ad). A comparative analysis for each group (gender and age) and between groups was performed). A statistical analysis was realized through the chi-square test to compare the type of tympanometric curve, presence and type of hearing loss. For the degree of hearing loss was used the Kruskall-Wallis and Dunn test. The comparison between sides, right and left, was made through the McNemar test for the type of curve, presence and type of hearing loss; and Wilcoxon test for the degree of hearing loss. To compare weight and age was used the Anova test. In all tests was adopted a significance level of 5% (p<0,05). The statistical analysis did not show any statistically significant difference between groups in the comparison of age (p=0,368), gender (p=0,099), and weight between G2 and G3 (p=0,342). Regarding gender and between sides, there was no statistically significant difference on the right ear, in relation to the type of tympanometric curve (p=0,733), presence of hearing loss (p=0,915), type of hearing loss (p=0,087) and degree of hearing loss (p=0,855), as well as for the left ear in relation to the type of tympanometric curve (p=0,700), presence of hearing loss (p=0,952), type of hearing loss (p=0,696) and degree of hearing loss (p=0,969). The result of the comparative analysis regarding the presence, the type and the degree of hearing loss in all three groups studied, is shown in Table 2. Of the total population studied, 107 ears presented audiometric thresholds within the normality standards, 26 belonging to G1, 33 to G2 and 48 to G3. Table 3 shows the distribution of occurrence and comparison between the three groups of tympanometric curves. The auditory reflexes were consistent with the result of the audiological assessment. Label: M = male; F = female. Regarding the hearing loss, we could see (Table 2) results with no statistically significance for the groups of children with cleft lip and palate, both for the ones born with low weight and for those born with normal weight, the same did not occur in relation to the children that do not have the craniofacial malformation and without low weight at birth, whose hearing loss was found, only, in two ears. This discovery makes us believe that the cleft is a much more important component to the hearing than the low weight. Studies (6, 7, 9, 16) frequently relate auditory problems to the presence of cleft lip and palate and/or low weight at birth. However, the alterations found in children born with low weight may be individual and depend on how low was the child's weight (17). Thus the result obtained in this study, without significance may be related to the weight of the children born with low weight, which showed proximity to the ones of the children from the other two studied groups and without statistically significance. Most recent literature have explored children born with extreme and too low weight, especially the ones below 1000g, once they are commonly exposed to other risk factors to hearing, such as ototoxic drugs, hypoxia and hyperbilirubinemia, which can lead to the appearance of a sensorineural hearing loss (18, 19, 20), as well as conductive loss (21). The hearing inside the normality standards, found in 65% of the sample of patients with cleft lip and palate, is in consonance with study (22), in which was found more than half of the children evaluated (63%) with normal hearing. Researchers (23) also identified absence of hearing loss in 77% of the children with cleft lip and palate non syndromic in study realized. Study (24) observed normal hearing and absence of otoscopic abnormalities, most frequently in children who were submitted to the lip surgery through the Millard technique and of the palate through Langenbeck palatoplasty with veloplasty intravelar. In the present study was not taken into account the age, nor the surgical technique of the lip and palate to which the children with cleft lip and palate were submitted. In relation to the type of hearing loss, we could verify that the conductive auditory loss was the one of greatest occurrence for the groups of children with cleft lip and palate with (G1) and without low weight at birth (G2). Conductive hearing loss of slight degree to moderate degree is the audiometric finding of greatest occurrence in the population with cleft lip and palate (25-27), agreeing with the present study, once these degrees were found in G1 and G2 in greater significant proportion than other types. Regarding the immittanciometry all types of tympanometric curves were presente for the three groups studied, with 58% (78 ears) of tympanograms A classified as normal, once this type reveals normal functioning of the tympano-ossicular system. Studies (24, 28, 29) confirm this finding. A percentage of 42 (57 ears) was classified as abnormal tympanometric curve, being observed a similar behavior among the groups of children with cleft lip and palate (G1 and G2) and a smaller occurrence in the population without this kind of craniofacial anomaly. Among the abnormal tympanometric curves a distribution almost homogeneous, without statistically significance, was observed between the studied groups. The type C curve, the most frequent among the abnormal tympanometric curves, in this study, was present in 7 ears of G1, 6 of G2 and 3 of G3, is demonstrative of a high negative pressure at the middle ear, reflecting alterations in the auditory tube (15), and can be associated to the normal function of the middle ear, as well as with the presence of fluid (30) suggesting a transition between these two conditions (31). The type B, despite the absence of statistical signifficance, was the most prevalente in the population with cleft lip and palate (G1 and G2). This type is caused, most commonly, by the reduction of mobility of the secondary tympanic membrane to the fluid of the middle ear, as well as the rigidity of the tympanum (scars), presence of formation of dense conjunctive tissue around the ossicles (tympanosclerosis), cholesteatoma or middle ear tumor (32). Obtained in lower occurrence, in this study, the curves Ad (9,5%) and As (9,5%), demonstrate, respectively, flaccidity of the tympano-ossicular system, due to cases of otitis media and/or disjunction of the ossicular chain (33) and state of rigidity (15). When studying the hearing of 44 children in ages from 8 to 14, both male and female, who had cleft lip and palate and/or palatine non-syndromic, researchers (18), found tympanometric curve type C (21,2%) as the greater occurrence, followed by curve type B (7,1%), being curve type Ad (3,5%) the least prevalent. This study allowed the observation of a greater impairment of the hearing, evidenced by conductive hearing loss of slight to moderate degree in children with cleft lip and palate, regardless of the presence of low weight at birth, when compared to the ones without this kind of craniofacial malformation. 1) Graduation. Academy of the Phonoaudiology Course of Faculdade de Odontologia de Bauru - USP. 2) Free Teaching. Professor Associate of the Department of Odontopedia, Orthodontics e Collective Health of Faculdade de Odontologia de Bauru - USP. 3) Postdoctoral in Audiology. Professor in Charge of the Department of Phonoaudiology-FOB-USP. Article received in March 22nd of 2011. Article approved in June 30th of 2011.